The BLACK + DECKER™ Handiprep Express is the ultimate universal kitchen tool. It replaces six different appliances, and stores easily on a compact storage base. The 300-watt motor base controls each attachment—just twist it into place and press the power button for easy operation. 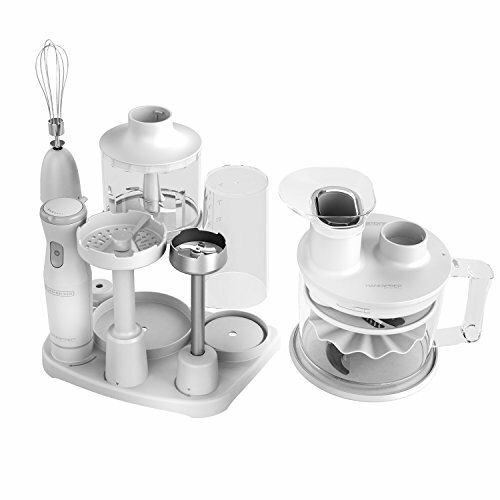 Attachments include: a potato masher, an immersion blender, a whisk, a food processor, and a mini chopper. The food processor comes with a slicing/shredding disk, a traditional S-blade, and an emulsifying disk. The mini chopper is perfect for chopping nuts, vegetables, and more. Mini Chopper - The 3-cup chopper bowl and blade are the perfect size for chopping nuts or cutting vegetables for salsa and more!